in Influencer Marketing with tags #HoldingAlltheCars, emoji, graphic design, instagram, Kevin McCauley, photography Both comments and trackbacks are closed. Content creator Kevin McCauley is a ‘triple threat’ artist – graphic designer, emoji illustrator, and photographer – known for his innovative style. As a designer, he homes in on images that are thought-driven and unique. As a custom emoji designer, he pinpoints where technology meets art and pop-culture. And in his photography, he puts his lifelong automotive passion first. We caught up with Kevin to learn he creates his content and keeps his fans engaged, and for a hint at what we can expect to see from him in the future. 360i: How do you describe the differences between being a graphic designer, photographer, and emoji illustrator? KM: Design is about finding a clean and concise way to tell a story. Emoji creation, on the other hand, is about using your creations to allow others to tell their stories. Photography is a place for more freedom of expression, at least for me. 360i: When and how did you start your Instagram profile? KM: When Instagram first launched I was immediately on board, but had trouble seeing the potential for using the platform to create quality “photography.” Instead, I would take five seconds to snap a shot with my iPhone while on-site for a photo shoot and post it without much effort or thought. Once the platform advanced its capabilities and I was able to see how great the Instagram community aspect is, I started to view the platform as a medium to explore my inner creative, particularly around photography of cars. 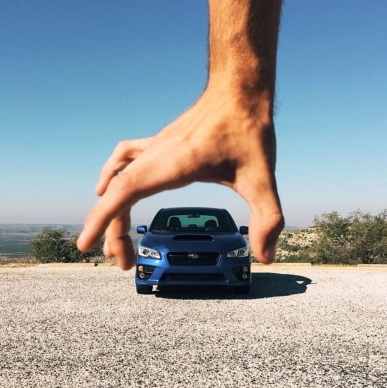 360i: You’ve started a #HoldingAlltheCars movement on Instagram. What inspired you to create the hashtag? KM: I just had the idea, and it seemed to encapsulate what I enjoy about Instagram – how it’s low-fi, achieved in-camera and totally imperfect – which is what makes it fun. If these images were seen in a magazine, it would be obvious they were retouched and composited together digitally – they might not even be given a second glance. But since I shoot #HoldingAllTheCars with an iPhone-only, you know that it’s honest and done in the moment with lots of thought. It also is a fun way to bring my friends into the images. 360i: Aside from your creative car content, you’re well-known for the emoji you’ve created. How did you get into emoji designing and illustrating? KM: It was completely random – I was contacted by social-media-savant @Seinfeld2000 about creating Seinfeld inspired emoji, and I jumped at the challenge. The Seinfeld emoji went viral and put me on the map, which has led to so many other opportunities with clients I’ve always dreamed of working with. The Seinfeld ones definitely hold a place in my heart –there were zero edits or changes, which, I later learned, is rare in the commercial emoji space. Another fun emoji project I recently worked on was an emoji for Yahoo! News. The company was writing a long-form article about Unicode and the emoji lobby, and came to me to create custom emoji to illustrate it. 360i: Are there any influencers you look to for inspiration or just admire– whether it’s for the content they’ve created or for their careers? KM: The list goes on and on! Duncan Wolfe, Grant Legan and Zach McNair are all insanely talented, endlessly inspiring – and a few of the kindest and most genuine people on this Earth. The same goes for Huseyin Erturk, who’s a brilliant car shooter and I feel does what I do, but better! I don’t know Emily Blincoe personally, but I’m in love with her work. Career-wise, it’s hard not to be inspired by high-profile people like Stefan Sagmeister and Kanye West – people who’ve disrupted their respective fields, and can step back from the grind and approach their work with a comfortable distance and a larger vision. 360i: Any exciting recent or upcoming work you can share with us? KM: I’m thrilled to share some of my recent work! I just finished designing a coffee table book for the Peterson Automotive Museum in Hollywood, CA. We had an amazing photographer, Evan Klein, shoot 50 stunning cars to feature – plus, as part of the project, there are tons of pages of history, exhibits, and the story of the museum’s radical renovation. It’s been a huge undertaking to be able to create a 180-page book and align on so many different visions. Earlier in the year, I also went to Detroit and shot some dark and moody images of the new Lincoln Continental Concept. It was a thrill in itself, because as a car nerd, I always stay current on auto news and see pictures as they’re released, so nothing is really ever a surprise. Being able to sign the NDA, hop on a plane and walk in a room with a car that only a handful of people in the world have seen was unbelievable. To view more of Kevin’s work, check out his website, Instagram, Twitter & Tumblr pages.